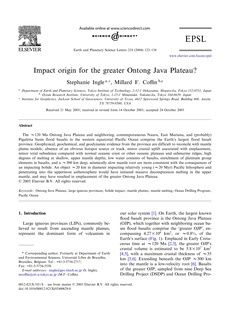 eCite - Impact origin for the greater Ontong Java Plateau? Copyright � 2003 Elsevier B.V. The ∼120 Ma Ontong Java Plateau and neighboring, contemporaneous Nauru, East Mariana, and (probably) Pigafetta basin flood basalts in the western equatorial Pacific Ocean comprise the Earth's largest flood basalt province. Geophysical, geochemical, and geodynamic evidence from the province are difficult to reconcile with mantle plume models; absence of an obvious hotspot source or track, minor crustal uplift associated with emplacement, minor total subsidence compared with normal oceanic crust or other oceanic plateaus and submarine ridges, high degrees of melting at shallow, upper mantle depths, low water contents of basalts, enrichment of platinum group elements in basalts, and a ∼300 km deep, seismically slow mantle root are more consistent with the consequences of an impacting bolide. An object ∼20 km in diameter impacting relatively young (∼20 Myr) Pacific lithosphere and penetrating into the uppermost asthenosphere would have initiated massive decompression melting in the upper mantle, and may have resulted in emplacement of the greater Ontong Java Plateau. © 2003 Elsevier B.V. All rights reserved.